Angie is trying to become a risk taker. 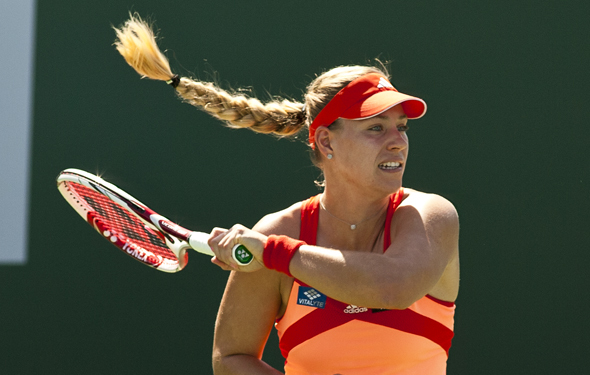 FROM THE APIA INTERNATIONAL SYDNEY – Angelique Kerber has been a very good, but not great player since 2011, when she came out of nowhere and reached the US Open semifinals. After that, and a very solid 2012, it appeared that lefthander really did have Grand Slam winning potential. She is naturally strong, is a terrific mover and is a standout defensive player. She has good but not great serve, but that is not uncommon on the WTA tour. She has world class two-handed backhand that she can slap into the corners. But her forehand has lacked some oomph, as has her return. Playing standout defense propelled her into the year-end top 5 in 2012, but her lack of improvement in 2013 saw her drop to the No.9 ranking, which is where she is now. Pro tennis is not all about aggression, but if you look at the WTA’s top three of Serena Williams, Victoria Azarenka and Maria Sharapova, it does require some high octane offense. That is what Kerber knew she had to bring to the table this year and it was that attitude and style that saw he blitz the powerful teenager Madison Keys 6-4, 6-2 in the Brisbane semis. Much of a player’s willingness to go for her shots has to do with confidence, and a willingness to make mistakes and move on. On Thursday in Sydney, Kerber actually attacked Keys’ big serve and let loose with her forehand ,which looked much improved and dangerous. She still needs to put balls back in play, but she has to go for openings. Kerber will be the favorite going into the final against the Bulgarian Tsvetana Pironkova, who played an excellent match in upsetting Petra Kvitova, but even if the German goes down, she knows that she has to keep attempting to change her mentality. Not too many players can claim wins over Serena, Sharapova, Aga Radwanska and Li Na, but she can. She also played Azarenka very close they last time they faced off. That indicates that some day, the 25 year old will have a legitimate chance to win a major, if she takes her gloves off. Tomic appears to have gained a bit more foot speed during the off season, is better balanced than he was last year and is clearly motivated to show his home country fans that he really is better than his world No. 51 ranking. On a cool night in Sydney, he also showed them that he can keep his head in a match that he was quite concerned about. Tomic could very well be better than his ranking, but outside of his fine Aussie summers, the 21 year old had never been a force on tour except for one strong Wimbledon. But that does not matter this week and won’t in the next two weeks in Melbourne. He has the tools to win Sydney again — although Juan Martin Del Potro, who bested Radek Stepanek and will face Dmitry Tursunov in the semis — will be the favorite to do so. And if Tomic can defend his title, or even reach the final and play the elite likes of Del Potro tough, then he will be worth a long look at the Aussie Open. Can the cagey Pironkova finally realize her dream and win her first WTA title?